Medical waste consists of discarded biological products removed from health care facilities. The 1988 Medical Waste Tracking Act defines medical waste as the waste material generated during medical research, testing, diagnosis, immunization, or treatment of either human beings or animals. Disposal of medical waste is a major challenge faced by health care providers. Medical waste is composed of contaminated blood, body fluids, body parts, infectious sharps, or other potentially hazardous biological material. Medical waste containers are used by waste generators to collect waste that is generated by health care facilities. They are available in different designs depending upon the type of waste that is to be collected. Containers are defined by specific colors and labels to make them distinguishable from others. Improved government participation in designing stringent regulatory acts aimed at proper disposal of medical waste across the globe is one of the major factor for the estimated expansion of the medical waste containers market during the forecast period. However, low awareness about specificity of medical waste disposal containers is expected to restrain the medical waste containers market in the coming years. The global medical waste containers market has been segmented based on product, waste, usage, medical waste generators, and region. Based on product, the global medical waste containers market has been classified into chemotherapy containers, radioactive containers, pharmaceutical containers, sharps containers, RCRA containers, and biohazard medical waste containers. The sharps containers segment has been further divided into patient room sharps containers, phlebotomy containers, and multipurpose sharps containers. In 2017, the pharmaceutical containers segment accounted for a significant market share and is expected to remain dominant during the forecast period. The significant expansion of this segment is attributable to the rise in number of health care facilities across the globe and improved regulations of the government regarding safe disposal of pharmaceutical waste. The RCRA containers segment is expected to expand at a sluggish pace between 2018 and 2026, owing to the lack of awareness about specificity of medical waste containers for specific type of wastes in emerging countries. In terms of waste, the global medical waste market has been categorized into infectious & pathological waste, non-infectious waste, radioactive waste, sharps waste, and pharmaceutical waste. The non-infectious waste segment accounted for significant revenue and market value share in 2017, owing to the emergence of numerous manufacturers of medical waste containers for the non-infectious waste category. The segment is expected to remain dominant during the forecast period, due to rise in awareness among the health care providers, who are aiming to avoid cross contamination and infections, regarding disposal of medical waste. In terms of medical waste generator, the global medical waste containers market has been segmented into hospitals, clinics & physicians’ offices, pharmaceutical companies, long-term care & urgent care centers, pharmacies, and others. Large quantity of medical waste being generated by multispecialty hospitals and rise in number of hospitals in developing countries are major factors responsible for the estimated rapid expansion of the hospitals segment in the coming years. The long-term care & urgent care centers segment is likely to expand at a slower pace during the forecast period, owing to the lack of well-equipped long-term care & urgent care centers in developing regions. Based on usage, the global medical waste containers market has been classified into reusable containers and disposable containers. Reusable containers accounted for a dominant market share in terms of revenue in 2017, which is attributable to the rise in sharps and hazardous waste in small and medium quantity waste generators and increased surgical procedures across the globe. In terms of region, the global medical waste containers market has been categorized into North America, Europe, Asia Pacific, Latin America, and Middle East & Africa. North America accounted for a prominent market share in 2017 in terms of revenue, which is attributable to rise in prevalence of infectious and chronic diseases that require advanced medical and surgical aids in the U.S. and presence of established players in the region. Europe is a prominent region of medical waste containers market, due to the rising adoption of specific containers for regulated and non-regulated medical waste by health care professionals. The market in Asia Pacific is expected to expand at a rapid CAGR during the forecast period, owing to increase in awareness about medical waste management and significant expansion in the pharmaceutical sector in countries such as China, Japan, and India. Prominent players operating in the global medical waste containers market are Sharps Compliance, Inc., Henry Schein, Inc., Becton, Dickinson and Company, Medtronic, Daniels Health, Bemis Manufacturing Company, Bondtech Corporation, Terra Universal, Inc., Thermo Fisher Scientific, Inc., EnviroTain, LLC, and MAUSER Group. Entering into strategic tie-ups with multispecialty hospitals is a major strategy followed by key players to stay ahead in the competition. The Medical Waste Tracking Act defines medical waste as the waste material generated during medical research, testing, diagnosis, immunization, or treatment of either human beings or animals. Disposal of medical waste is a major challenge faced by health care providers. Medical waste containers are used by waste generators to collect waste generated by health care facilities and are available in different designs depending upon the type of waste to be collected. Containers are defined by specific colors and labels to make them distinguishable from others. Rise in investments in R&D of novel medical waste containers and increase in incidence of illness & chronic diseases are boosting the global medical waste containers market. Establishment of government regulations for conservation of the environment and safe disposal of medical waste is one of the major factors expected to drive the expansion of the global medical waste containers market during the forecast period. The medical waste containers market report comprises an elaborate executive summary, which includes market snapshot that provides information about various segments. It also provides information and data analysis of the global market with respect to the segments based on product, usage, waste, medical waste generator, and geography. A detailed qualitative analysis of drivers and restraints, opportunities, and trends has been provided in the market overview section. Additionally, the section comprises detailed regulatory scenario of India, the U.S., South Africa, Australia, the U.K., and Europe in terms of their medical waste segregation and treatment and disposal guidelines. Key mergers and acquisitions and their objectives are provided in the global medical waste containers market to help understand the competitive landscape in the market. Moreover, advancements in product development for recent years are provided in the report. This report also provides market attractiveness and its analysis in terms of geography and market share analysis by key players, thus presenting a thorough analysis of the overall competitive scenario in the global medical waste containers market. The global medical waste containers market has been segmented based on product, waste, usage, medical waste generator, and region. 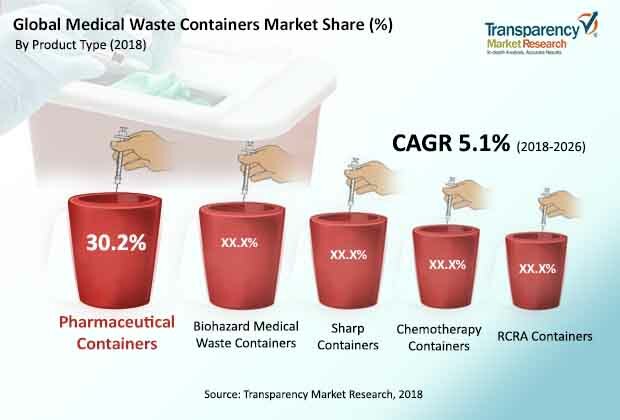 Based on product, the global medical waste containers market has been categorized into chemotherapy containers, radioactive containers, pharmaceutical containers, sharps containers, RCRA containers, and biohazard medical waste containers. The sharps containers segment has been further divided into patient room sharps containers, phlebotomy containers, and multipurpose sharps containers. In terms of waste, the global medical waste containers market has been classified into infectious & pathological waste, non-infectious waste, radioactive waste, sharps waste, and pharmaceutical waste. Based on medical waste generator, the global medical waste containers market has been segmented into hospitals, clinics & physicians’ offices, pharmaceutical companies, long-term care & urgent care centers, pharmacies, and others. In terms of usage, the global medical waste containers market has been classified into reusable containers and disposable containers. All the segments have been analyzed based on new product launches, regional demand for specific container types, regulatory policies for containers, and number of manufacturers in the global market. The market size and forecast for each of these segments have been provided for the period from 2016 to 2026, along with their respective CAGRs for the forecast period from 2018 to 2026, considering 2017 as the base year. Based on region, the global medical waste containers market has been categorized into five major regions and key countries in the respective regions: North America (the U.S. and Canada), Europe (the U.K., Germany, France, Italy, Spain, Russia, and Rest of Europe), Asia Pacific (China, Japan, India, Australia & New Zealand, and Rest of Asia Pacific), Latin America (Brazil, Mexico, and Rest of Latin America), and Middle East & Africa (South Africa, GCC Region, Israel, and Rest of Middle East & Africa). The market size and forecast for each of these regions and the mentioned countries have been provided for the period from 2016 to 2026, along with their respective CAGRs for the forecast period from 2018 to 2026, considering 2017 as the base year. The research study also covers the competitive scenario in these regions. The report also profiles the major players in the market and provides various attributes such as company overview, financial overview, product portfolio, business strategies, and recent developments. Major companies profiled in the medical waste containers market are Sharps Compliance, Inc., Henry Schein, Inc., Becton, Dickinson and Company, Medtronic, Daniels Health, Bemis Manufacturing Company, Bondtech Corporation, Terra Universal, Inc., Thermo Fisher Scientific, Inc., EnviroTain, LLC, and MAUSER Group.